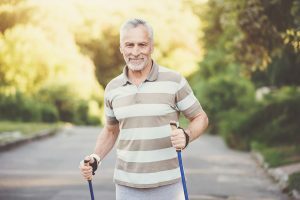 Senior Care in Annapolis MD: Could Walking Faster Extend Your Parent’s Life? ← How Can Home Care Help Adults with Cerebral Palsy? Could Walking Faster Extend Your Parent’s Life? Walking is an excellent form of exercise for older adults. It helps to strengthen muscles, lowers the risk of some diseases, and assists with weight control. It can also help with balance and mobility, which decreases the risk of falling. Any walking is good, but does walking faster have a greater benefit? New science says it might. Walk Faster to Increase Life Span. Researchers in Europe conducted a study using death records and responses to surveys received between 1994 and 2008. The data showed that people who walked at a brisker pace reduced their risk of dying prematurely. The research showed that in comparison to walking slowly, people who walked at an average pace lowered their risk by 20 percent. Walking at a brisk pace lowered the risk by 24 percent. For older adults, the benefits were even greater. In people older than 60, walking at an average pace lowered the risk by 46 percent and walking briskly lowered it by 53 percent. Now, that doesn’t mean that all seniors should get out there and walk as fast as possible. Instead, if your aging relative is planning to start walking for exercise, talk to their doctor first to determine if they are healthy enough and what rate would be most beneficial. In addition, if the person has mobility problems, it may be best to walk more slowly to prevent a dangerous fall. Remember, any physical activity is good for them, even walking at a slow pace. When crossing the street, use a crosswalk whenever possible. Walk during daylight hours wearing brightly colored clothing. However, if the older adult must walk at night, they should carry a flashlight and wear reflective clothing to ensure they are visible. Walk on sidewalks where they are available. When there is no sidewalk, walk facing oncoming traffic in the shoulder of the road. Be aware of the people around them, especially skateboarders, bicyclists, and runners. Avoid distractions such as using a smartphone while walking. Even talking on the phone may create enough of a distraction to cause a fall. If your aging relative likes to walk with their dog, the dog should be kept on a short leash. Long leashes and flexi leashes may cause the older adult to trip or trip others. It also makes it more difficult to control the dog, which can result in fights with other dogs or the dog running into the street. Senior care providers can also help keep older adults safe while they walk. A senior care provider can walk with the person and offer a steadying arm to prevent falls. Senior care providers can also make sure they are wearing appropriate shoes that fit well and have good traction. If you or an aging loved-one are considering professional senior care in Annapolis, MD, please call the caring staff at Global Hands Inc. Call today 240-264-0769. This entry was posted in Senior Care in Annapolis MD and tagged Senior Care in Annapolis MD. Bookmark the permalink.